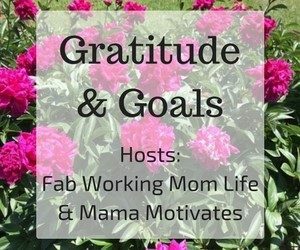 Welcome to the Weekly Gratitude and Goals Linky Party hosted by Julie at Fab Working Mom Life and Suzanna at Mama Motivates! The idea behind this party is to take a step back and reflect on those things, both large and small, that we are thankful for in our lives this past month as well as think about what goals we may have for ourselves for the upcoming month. So share a list of everything and anything you are thankful for and add any goals you have. This party will start on the first Friday of each month, but you are welcome to link up anytime during the month. I’m so glad to be hosting this link up with Julie again this year. I think it is so important and helpful to pay attention to all of those things we are grateful for while also looking forward and spelling out our goals each month. It’s a lot easier to see that we had a good month when we can go back and check off our goals and the things we accomplished. A few behind-the-scenes projects that I can’t wait to share about! Link back to the Gratitude and Goals linky party somewhere on your site (a linky party participating page is just fine). Link up the permalink to your post, not the link to your homepage. Please link up relevant posts only. We reserve the right to remove off-topic posts. Hop around and show some love to other participants. Share on social media using the hashtag: #GratitudeGoals.